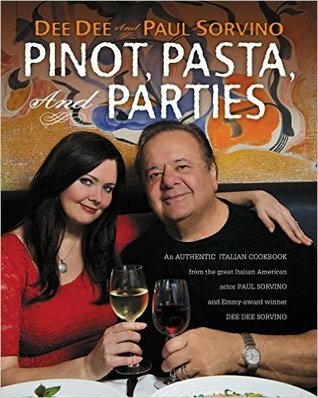 Goodfellas star Paul Sorvino and Emmy-award winner Dee Dee Sorvino create delicious, authentic Italian recipes in this entertaining cookbook. Dee Dee and Paul Sorvino do their best to make everyday a party. They celebrate life and being with each other in big and small ways as often as they can. They believe that the best way to celebrate or to solve the problems of the world is with a nice glass of wine and bountiful meal. No subject is taboo at their lively dinner table-especially when cocktails are served! Providing a glimpse into their bi-coastal life and tales of Paul's acting career, this authentic Italian cookbook offers 80 recipes with menus for relaxed entertaining. From a Goodfellas' feast to a picnic with an Italian accent, from an abundant buffet to elevated Italian street fair food, the Sorvinos know how to turn out meals that are as delicious as they are fun. Their easy-to-prepare, mouthwatering recipes range from regional Italian classics to new takes on traditional food. Stuffed clams oreganata, unique bruschetta combinations, pasta e faigioli, pizza salumeria, farfalle with asparagus and pancetta, Pauls' famous meatballs and spaghetti sauce, chicken scarpiello, panzanella, grilled figs with honey and walnuts are just a few of the outstanding recipes found in Pinot, Pasta, and Parties . The food is so good at the Sorvinos' that theirs is the place of choice for casual get-togethers wherever they are. This cookbook is absolutely gorgeous! Immediately the pictures grabbed my attention and then I started reading the ingredients. I felt that this cookbook was way out of my league, but I preserved on and continued to read. I found that their are many recipes in this cookbook that I could actually cook, but a majority would require a lot of ingredients that I don't carry in the cupboard on a regular basis. This book will instantly make you feel 10 pounds heavier because of the deliciousness, especially when you get to different desserts. I found that I could see many of friends who are chefs would love this book, especially since they love authentic Italian recipes. This book is filled with recipes that are mouth watering and I CANNOT wait to make their marinara sauce! It sounds exquisite! If you love to cook or know someone who does, this book is for you! You won't be disappointed. The pictures are gorgeous. The recipes offer step by step ingredients and you are sure to have a full and satisfied stomach afterwards! Thank you to the generous publishers at Center Street for providing me a complimentary copy for my honest review. A favorable review was not required. I give this book 5/5 stars and the opinions expressed here are my own.